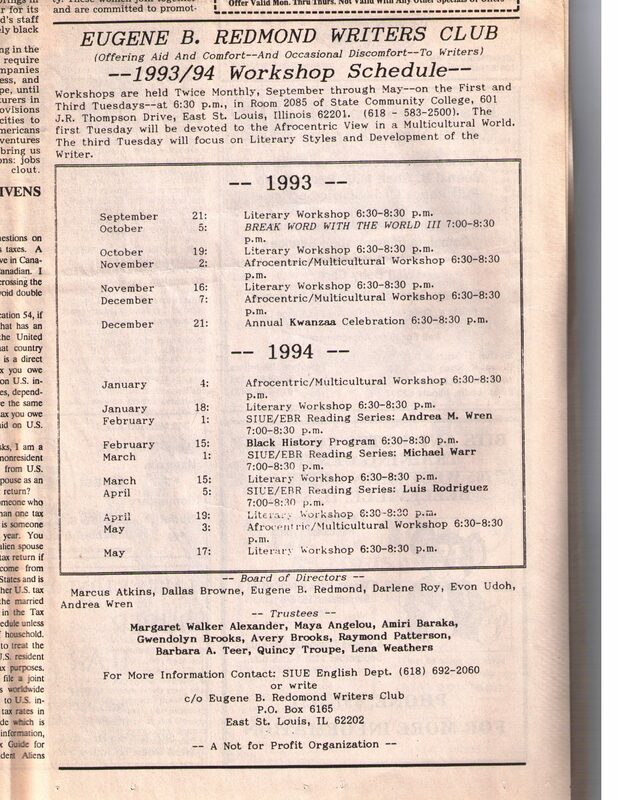 East St. Louis Poet Laureate and SIUE professor, Eugene Redmond, formed the Eugene Redmond Writers club in March of 1986. Its charter members included Sherman Fowler, Michael Fontaine, Darlene Roy. According to the group's website, "While tutoring--and giving exposure to--writers, the group also produces cultural-literary events, like Pre-Kwanzaa and "Fresh & Ancestral," for the community. In addition, it "souljourns" to conferences and festivals in the US and abroad, and collaborates with SIUE's English Department in publishing Drumvoices Revue, Break Word with the World, and anthologies of student writings."